The visit of Donald Trump to Jerusalem and Bethlehem today, and the potential for a frightening fallout from last night’s horrific attack in Manchester has caused me to pray all day for the peace of Jerusalem and for the good people of all faith for whom Jerusalem is a sacred and holy city – Muslims, Christians and Jews. Anglicans in the Middle East have been in my prayers in a special way since last week, when Archbishop Suheil Dawani of the Diocese of Jerusalem was elected as the next Primate of the Episcopal Church of the Province of Jerusalem and the Middle East. He succeeds Archbishop Mouneer Hanna Anis, who has held this post since 2007. Archbishop Dawani will serve as Primate for a period of 2½ years, to be followed by Bishop Michael Lewis of the Diocese of Cyprus and the Gulf. Bishop Michael, who will serve for the same length of time, ending in May 2022, was one of the speakers at the USPG conference in High Leigh three years ago . I met Archbishop Suheil Dawani and his wife Shafeeqa most recently when they visited Dublin at the end of last year [1-7 December 2016]. Their visit was part of the Jerusalem Link partnership between the dioceses and the programme has been put together by the Diocesan Council for Mission. During that visit, Archbishop Suheil gave a reflection at an ecumenical service in Christ Church Cathedral, Dublin. The Anglican Diocese of Jerusalem has 27 parishes spread through the five political regions of Israel, Palestine, Jordan, Syria and Lebanon. The new Primate is a strong advocate of peace and reconciliation and is engaged in many ecumenical and interfaith projects, and he works closely with the Archbishop of Canterbury on Anglican and interfaith issues. He is one of the 13 recognised Heads of Churches in Israel. The Most Revd Bishop Suheil Salman Dawani was consecrated as Bishop Coadjutor of the Episcopal Diocese of Jerusalem in 2006, and he was installed as the diocesan bishop and the 14th Anglican Bishop in Jerusalem in 2007. Dr Dawani was born in Nablus on the West Bank in 1951, studied at the Near East School of Theology in Beirut, and was ordained deacon in 1976 and priest in 1977. He served at Saint George’s Cathedral, Jerusalem, Saint Andrew’s, Ramallah, and Saint Peter’s, Bir Zeit, in the West Bank. He then studied at Virginia Theological Seminary in the US, and in 1987 he was appointed the priest-in-charge of Saint John’s Church, Haifa. He then served again in Ramallah and Bir-Zeit until 1997, when he was elected the General Secretary of the Diocese of Jerusalem and returned to Saint George's Cathedral, Jerusalem, as the canon pastor of the Arabic-speaking congregation. There he was engaged in ecumenical and interfaith work, organised summer camps for Muslim and Christian children, and led a visit by a Jewish-Arab group to the US under the name ‘Kids for Peace.’ He returned to Ramallah, until 2007, when he became diocesan bishop. and keep the worshippers of Thy name in peace. O pray for the peace of Jerusalem, they shall prosper that love thee. Peace be within thy walls, and plenteousness within thy palaces. It was a busy day in Rathkeale yesterday, which included a school visit, a committee meeting, and meetings with parishioners. Outside Holy Trinity Church and the churchyard on Church Street, a workforce sponsored by Rathkeale Community Council is painting the railings and the churchyard boundary wall beside the school, and planting flower boxes along the footpath. This work shows how the church is owned by the local community, and as we stood talking the workers involved took personal pride in the state of the churchyard and its associations with local history and heritage. As Spring turns to Summer this week in this part of West Limerick, the brighter colours on the railings and the wall add to the sparkle in the town in the bright sunshine. In between meetings, I walked out into the countryside south of Rathkeale, where the fields have long turned from the brown of winter to the green and gold of summer. He had many stories about the house, which has been in his family for four or five generations, and which has a history that may go back 400 years. ‘Six degrees of separation’ is too relaxed a description of connections in Ireland … it turned out I have known his brother for yours. Later, by River Deel, the waters were clear blue under the bright summer sun. But there was work to be done, and I headed off to Bloomers for a management of the Rathkeale Pre-Cohesion Social Project. Today marks the fourth centenary of the birth of an amazing and at times enigmatic son of Lichfield. Elias Ashmole (1617-1672), the founder of the Ashmolean Museum in Oxford, was born at 5 Breadmarket Street in Lichfield 400 years ago on this day, 23 May 1617. Elias Ashmole was a celebrated English antiquary, politician, herald, genealogist, astrologer and alchemist. Ashmole supported the royalist side during the English Civil War, and at the restoration of Charles II he was rewarded with several lucrative offices. His library reflected his wide range of interests, including history, law, numismatics, chorography, alchemy, astrology, astronomy, and botany. He was one of the founding Fellows of the Royal Society and an early freemason, and his interests ranged from the antiquarian and the mystical to the scientific. An avid collector of curiosities and artefacts, he donated most of his collection, his library and his manuscripts to the University of Oxford to create the Ashmolean Museum. Throughout his life, he returned constantly to Lichfield, and twice he stood without success in parliamentary elections, hoping to become MP for Lichfield. Ashmole was born in Breadmarket Street, Lichfield. His mother, Anne, was the daughter of a wealthy Coventry draper, Anthony Bowyer. His father, Simon Ashmole (1589-1634) was a saddler and been a soldier in Ireland during the Earl of Essex’s campaign. His grandfather Thomas Ashmole had been Mayor or senior bailiff of Lichfield in 1604 and 1612, and sheriff of Lichfield in 1593, and his uncle, also Thomas Ashmole, was Mayor in 1651 and Sheriff in 1638 and 1660. He was given the name Elias, the Latin form of the name of the prophet Elijah, by his godfather Thomas Otley, the sacrist of Lichfield Cathedral. 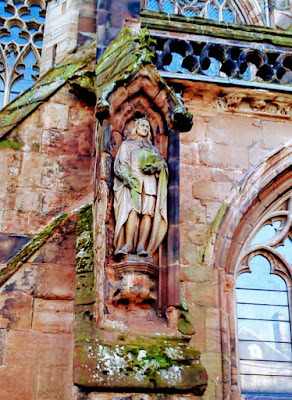 The young Elias Ashmole attended Lichfield Grammar School (now King Edward VI School) and was a chorister in Lichfield Cathedral, where he was taught singing by the composer Michael East, who was the master of the choristers, and keyboard music by Henry Hinde, the cathedral organist. Ashmole left Lichfield in 1633 to live in London. He qualified as a solicitor in 1638, and that year he married Eleanor Mainwaring (1603-1641) from Cheshire. Eleanor died while pregnant three years later on 6 December 1641, and Ashmole threw himself into the political and military conflicts of the day. He supported Charles I throughout the Civil War. At the outbreak of fighting in 1642, he moved to Cheshire, and in 1644 he was appointed the King’s Commissioner of Excise at Lichfield. From Lichfield he moved to Oxford, where he became an ordnance officer in the King’s forces. While he was in Oxford, he studied mathematics and physics at Brasenose College, where he had lodgings. He seems never to have taken part in any actual fighting during the Civil War, and after the surrender of Worcester in July 1646, he retired to Cheshire. 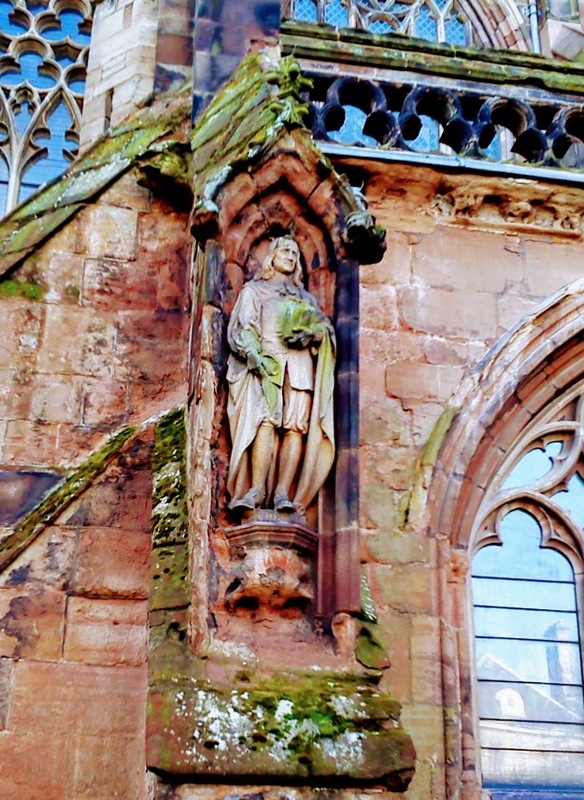 On his way, he returned to Lichfield, where his mother had died three weeks earlier from the plague. His first wife, Mary Lady Mainwaring, was a daughter of Sir William Forster of Aldermaston. When they married in 1649, she was 20 years older than him, had been widowed three times, and she was wealthy. The marriage was not a happy one, but when Lady Mainwaring sued separation and alimony, her case was dismissed by the courts in 1657. Ashmole was now wealthy enough to pursue his interests, including botany and alchemy. At the restoration of Charles II in 1660, Ashmole was rewarded richly for his loyalty and was appointed Secretary and Clerk of the Courts of Surinam and Comptroller of the White Office, Commissioner and then Comptroller for the Excise in London, and later Accountant-General of the Excise. He was also involved in organising the coronation. He was appointed to the College of Arms in 1660 as Windsor Herald. Ashmole performed his heraldic and genealogical duties scrupulously, and in 1663 he was back in Lichfield when he was involved in the Visitation of Staffordshire, which was carried out by the antiquarian and the Norroy King of Arms, Sir William Dugdale (1605-1686). Dugdale was assisted by two heralds who were born in Lichfield and educated at Lichfield Grammar School – his clerk, Gregory King (1648-1712), who later became Lancaster Herald and a pioneering statistician, and Dugdale’s future son-in-law, Elias Ashmole. Dugdale and Ashmole, undoubtedly, were familiar with the career of William Comberford: Dugdale had been commissioned in 1641 to make a copy of all the monuments in the main English cathedrals and churches, including Lichfield Cathedral and Saint Editha’s Church, Tamworth, and received his MA at Oxford with William Comberford in November 1642; William Comberford was ialso nvolved in the Civil War in Lichfield while Ashmole was the King’s Commissioner of Excise at Lichfield. At the time of the Visitation of Staffordshire, William Comberford’s brother, Robert Comberford was 69 and living at Comberford Hall. On the first day of the Visitation in Lichfield, on 30 March 1663, Robert certified the pedigree for the Comberford family of Comberford, and furnished Ashmole with many of the details of the family. However, Sydney Grazebrook, who edited the Visitation for publication by the Harleian Society, insightfully asks why Robert Comberford failed to furnish a number of pertinent particulars, including the full name of his father-in-law. In addition, it might be asked why he failed to provide dates of death for his brothers and sisters, or particulars of their marriages and children, some of which ought to have been known to both Ashmole and Dugdale, and all of which would have helped avoid confusion to later generations tracing the family tree. Ashmole presented the magnificent Ashmole Cup to Lichfield in 1666, and it remains in the civic collection of plate and insignia. The former Lady Mainwaring died on 1 April 1668, and seven months later, on 3 November, Ashmole married Elizabeth Dugdale (1632-1701), the much younger daughter of his friend and fellow herald Sir William Dugdale. In 1675, he resigned as Windsor Herald, perhaps because of factional strife within the College of Arms. He was offered the post of Garter Principal King of Arms, but turned down this offer in favour of Dugdale. Ashmole stood as a candidate in the 1678 by-election caused by the death of Richard Dyott. During the campaign, Ashmole’s cousin, Thomas Smalridge, who was his campaign manager, fell ill and died. Ashmole did not visit the constituency, and he lost the election to Sir Henry Lyttelton. Ashmole still appears to have had an urge to return to Lichfield, and once again in 1685 he stood as an election candidate. But he stood aside at the request of James II. On election day, all votes cast for Ashmole were declared as votes for the King’s candidate, and through this ruse Richard Leveson was elected MP for Lichfield. Elizabeth’s pregnancies all ended in stillbirth or miscarriage, and Ashmole never had any children. He died at his house in Lambeth on 18 May 1692, and was buried at Saint Mary’s Church, Lambeth, on 26 May. He bequeathed the remainder of his collection and library to Oxford for the Ashmolean Museum, which is considered by some to be the first truly public museum in Europe. Lichfield Grammar School in Saint John Street, where Ashmole went to school is now the Chamber of the Lichfield District Council Chamber, and Ashmole’s birthplace in Breadmarket Street is now a solicitor's office, marked by a stone plaque. Later this year, to mark the 400the anniversary of his birth, Lichfield Cathedral is hosting an exhibition, ‘Discovering Elias Ashmole.’ The exhibition, from 19 October 2017 to 18 February 2018, offers an opportunity to find out more about the life and times of this celebrated son of Lichfield.